NSRIT from the inception has established a separate Training & Placements Dept, headed by a full time Placement Officer (Training & Placements) assisted by 5 faculty members as 'Faculty Coordinators' to maximize the opportunities for all our students in software as well as core sectors. All the students are given Campus Recruitment Training on Quantitative Techniques, Logical Reasoning, Verbal Reasoning, English Grammar, Group Discussions, conduct Mock interviews, Tips and Tricks of Interviews etc from the first year onwards. A full time in-house expert trainers on the above mentioned subjects will train the students. We conduct continuous Assessments to make and Analyze the students in the aspects Aptitude , Reasoning , Communication skills, soft skills etc, and take the l feed back from our recruiters at the end of their recruitment process, collect performance of our alumni working with them; and implement them in the next training sessions for better performance. We have sufficient logistic support like AC Auditorium (300 occupancy), Examination Halls (700-occupancy at-one-go), AC interview rooms etc for on/pooled campus selections. With the co-ordination of all these stake holders, we could increase our placement percentage year on year and serve for the best placements to the student community. 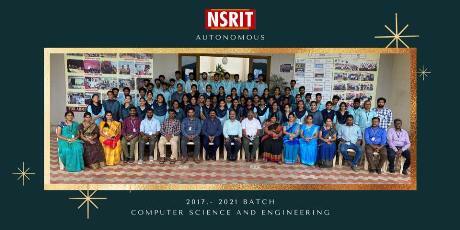 We are proud to say that NSRIT ranked in the Top-Twenty Most Preferred Colleges out of 700+ private engineering colleges in the state of AP (as per APSCHE, the body which conducts engineering admissions in the state).